George Papandreou, the new Greek prime minister, and his cabinet were sworn into office on Tuesday, after winning general elections held on Sunday. 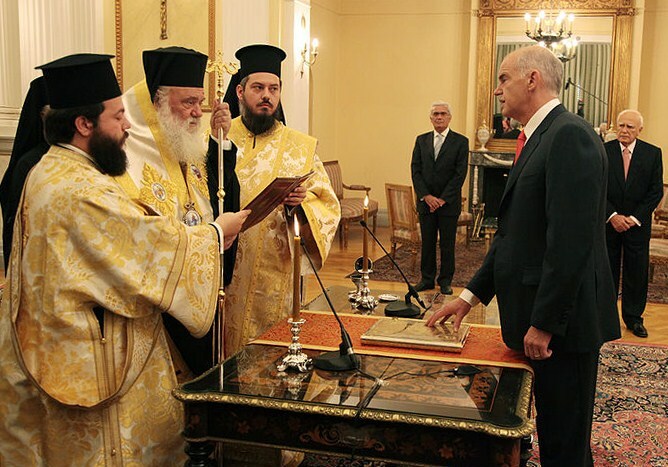 Papandreou, whose socialist PASOK party won the snap general elections, will also be foreign minister, a post he held from 1999 to 2004 in the cabinet of then Prime Minister Costas Simitis. A new position, deputy prime minister, has been introduced, going to Theodoros Pangalos, who served as foreign minister between 1996 and 1999. Louka Katseli will be economy minister. She was special economy adviser to Papandreou’s father – Andreas Papandreou – between 1993 and 1996, when he was prime minister. George Papaconstantinou, a European Parliament lawmaker, is the new finance minister. Papaconstantinou has his work cut out for him, especially in tackling a ballooning budget deficit, which is projected to exceed 6% for 2009, a shrinking economy, and widespread public debt. Evangelos Venizelos will be national defence minister, while Tina Birbili will be environment, energy and climate change minister. The new government will have sixteen ministries, five of which will be headed by women. “This cabinet has George Papandreou’s stamp [of approval] all over it, he’s utilising all of his close associates and creating a significantly upgraded Maximos Mansion,” veteran Washington correspondent and Kathimerini editor Tim Ellis said on Wednesday, referring to the official residence and primary workplace of the prime minister. PASOK, formerly Greece’s biggest opposition party, won a convincing victory in Sunday’s snap elections, attracting 45% of the votes and an absolute majority of 160 seats in the 300-seat parliament.